It is a Saturday morning, and inexplicably, I am awake and out of bed at 9AM. For those who know me well, you know how bizarre this is. I think China is making me into a normal adult. Back in Toronto I would regularly sleep until noon without even realizing it. Of course, that probably had something to do with crazy hospital shift work, switching between nights and days all of the time. Or, it could have been that my bedroom was very dark and the hotel room here is flooded with light every morning at 7AM. Or, it could be that I am finally like everyone else, working Monday to Friday and appreciating more than ever what a weekend is. Namely, you can’t waste one hour of it! Working as a nurse, weekends are irrelevant. I worked many weekends and often had days off during the week, or a random stretch of 4, 5, even 7 days off. When you are doing hard work like nursing, some sort of primal sleep need takes over and you use up half of your free days sleeping. You are never sure if you should be awake or asleep. I guess I am coming to like the routine of a steady Monday to Friday routine, even though I grumble most mornings. So here I am, awake, drinking a nescafe, reading the online newspaper. I am sure you have heard about the chemical plant explosion and subsequent contamination of the water supply with benzene in the Northern Chinese city of Harbin. Don’t worry about us, we are several thousand miles south of there. These sorts of things are par for the course here in China. A plant of some kind explodes everyday somewhere in the country. I see this as one of the biggest problems facing the country – the horrible pollution and the seeming lack of safety and anti-pollution measures at the plants. I suppose that it is how it is in developing countries, but as China grows economically, they cannot allow this contamination to continue. Between our airport and the city, one of the instructors counted around 15 coal power plants. Back home in Texas, I lived a mile from a coal power plant, but I don’t believe we had any noticeable pollution, just a lot of noise. Here, well, it is just unbelievable. Although, since I wrote that last post about pollution, the days have been incredibly clear, with blue sky and a nice breeze. Maybe I should make these comments more regularly in order to improve the conditions. As for bird flu, according the China Daily, there have been human cases in China. I am not to clear on how many deaths there have been from the deadly H5N1 strain. Of course, the Health Ministry is denying rumors that they haven’t reported all the deaths related to bird flu. Honestly, I am not too concerned about this threat. I hadn’t really meant this entry to be about this kind of thing, it just happens to be what I was reading about online today. What I meant to blog about was our dinner last night. A new restaurant has opened at the airport. We’ve been watching the progress of the building for a month now. It opened a few days ago. It has a large sign outside in Chinese and English. 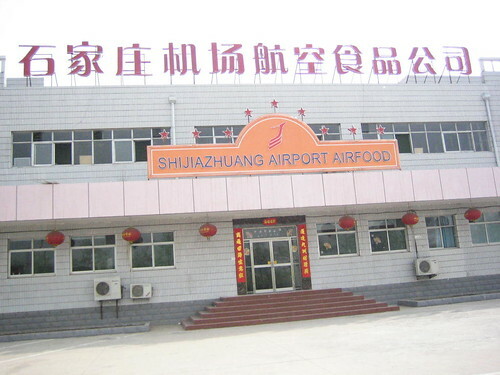 The English name is: Shijiazhuang Airport Airfood. We just had to give this airfood a try. The whole restaurant is made up of small individual rooms for private dining. Their menu is all in Chinese, with no pictures, so we had to use the phrasebook to order. The waitress that took our order asked us to write down the English name of the dishes we ordered. Maybe they want to make an English menu, too. I am always surprised when someone goes above and beyond to try to understand us. I mean, obviously we should be learning their language and not just expect to be catered to in English, but the language is difficult and it is nice when you find someone willing to try and understand our half-English, half-Chinese efforts. I think many times they like to practice their English, too. The food was not bad and we had a good time. The other day I went to the Kwik-E-Mart for lunch by myself. I had my usual Fried Rice. The girls who work there, who see me frequently through the week, decided that since I was alone, they would try out their English with me. (Maybe they are too intimidated by DH and the gang to try English with them?) It was mostly basic English greetings: How are you? What is your name? Where are you from? The girls would consult with each other in Chinese, turn to me and ask me the question. When I responded, they would turn to each other, consult some more, and then turn back and say something else. There was a lot of giggling on their part, too. With their limited phrases the whole conversation couldn’t last long, but I thought it was nice. This coming week my aim is to study more Chinese. This entry was posted on 26 November 05 at 9:02 and is filed under China, Expat Life, Restaurants. You can follow any responses to this entry through the RSS 2.0 feed. Both comments and pings are currently closed.